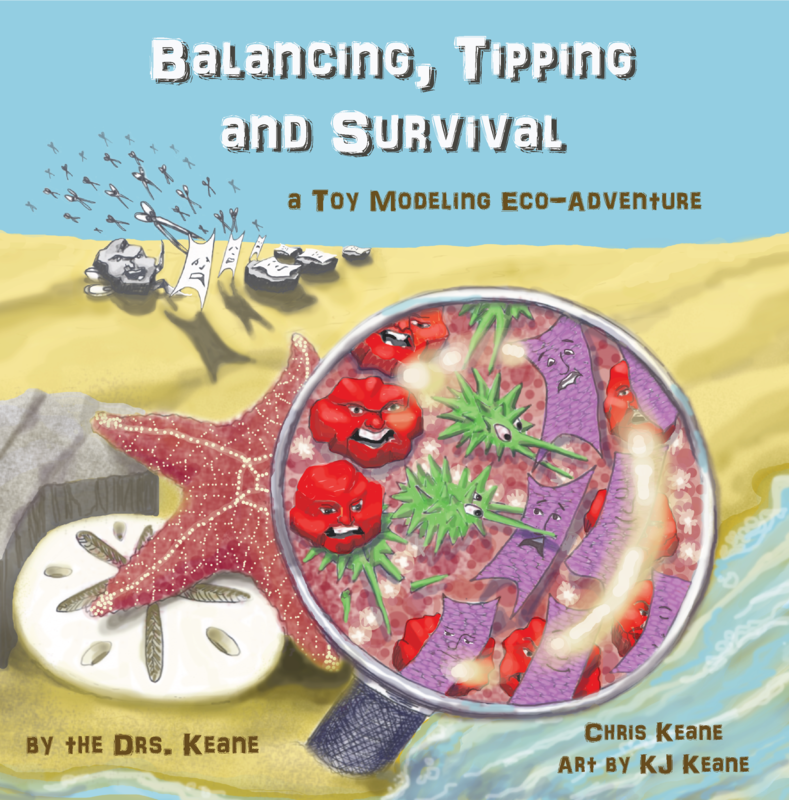 Taking you on an eco-adventure, this book uses fun toy models and beautiful illustrations to explore ecosystem balancing and tipping. Available on Amazon & Kindle. Life on earth has survived five mass extinctions, periods when a great many types of life forms suddenly disappear. The most recent mass extinction was many millions of years ago. Since then, our ecology and the climate supporting it has experienced a relatively steady state. That ecological balance supporting life is now in danger of tipping, and this could cause a sixth mass extinction. But you can take action to help prevent this, once you understand ecosystem balancing and tipping. A good way to learn about balancing and tipping is through toy models, simplified or smaller versions of the larger real world. An example of a toy model is the famous Daisyworld. Another example is Climate Change model (by NetLogo designers). Toy models of ecological dynamics can be an adventure into the wonder of microbial, ocean and land diversity. Life exists far from equilibrium. Yet organisms and ecology seems to be engaged in balancing with periodic tipping. Flock Eco-Games explores toy models of balancing and tipping in predator-prey interactions, population growth, solar energy systems, climate change, and human behavior. These dynamics have very important ecological, climate and health consequences. One of our board games has the title “Little Tip: A Barely Balanced Ecosystem Game” to suggest that ecological balancing is precarious, but the term balanced can be misleading if it implies that the ecology can resist human interventions. Our toy models show how periods of balance may last a long time, but are nonetheless punctuated by tipping, much as in earth’s ecological history. Toy models of such ecological dynamics can be great fun, and fascinating, engages mathematical thinking and scientific thinking, and is an adventure into the wonder of microbial, oceanic and terrestrial diversity.